Jeremy R. asks: How did Switzerland manage to stay neutral during WWI and WWII? 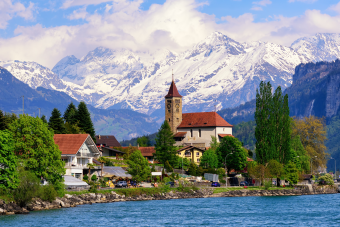 The tiny mountainous country of Switzerland has been in a state of “perpetual neutrality” since the major European powers of the time declared it as such during the Congress of Vienna after the end of the Napoleonic wars in 1815. The French conquered Switzerland in 1798, establishing the Helvetic Republic in attempt to make Switzerland something of a strategically positioned French satellite state. Not long after, Austrian and Russian forces invaded the country in their war against France. The Swiss, rather than fighting alongside their French overlords, largely refused. This ultimately led to the Act of Mediation, giving the Swiss back much of their former independence. Twelve years later, they got the rest thanks to the aforementioned Congress of Vienna in which their neutrality in the wars of their neighbors was officially recognised. Beyond the Swiss themselves having long tried to stay out of the conflicts of Europe (since the early 16th century after a devastating loss at the Battle of Marignano), part of the reason Switzerland was granted neutrality in perpetuity in 1815 is because the European powers of the time deemed that the country was ideally located to function as a “a valuable buffer zone between France and Austria”. Thus, granting their neutrality in wars, so long as they continued to stay out of them, would “contribute to stability in the region”. Since that time, with a few minor exceptions, Switzerland has steadfastly refused to compromise its neutrality for any reason, though on the war-front they did suffer an exceptionally brief civil war in the mid-19th century resulting in only a handful of casualties. While minor in its scale, this civil war drastically changed the political landscape of the Swiss government, including the establishment of a constitution partially borrowing from the then less than a century old United States constitution. In any event, as for those aforementioned “minor exceptions”, Switzerland has occasionally taken part in some global peacekeeping missions and prior to 1860 Swiss troops did sometimes take part in various skirmishes, despite their neutrality. In more modern times, Switzerland needed to defend its borders from both Allied and Axis (see: How Did the Axis and Allies Get Their Names) air incursions during WW2. For instance, they shot down nearly a dozen German planes in the spring of 1940 alone, as well as shot down some American bombers and forced down countless others on both sides. This included grounding and detaining the crews of over a hundred Allied bombers that tried to fly over the country. When Hitler tried to counter Swiss measures at keeping the Luftwaffe from their skies by sending a sabotage team to destroy Swiss airfields, the Swiss successfully captured the saboteurs before they could carry out any bombings. You might think it a bit silly for the Swiss to risk war with both sides by shooting or forcing down foreign aircraft from their skies, but on several occasions Allied bombers accidentally attacked Swiss cities, mistaking them for German ones. For instance, on April 1, 1944, American bombers, thinking they were bombing Ludwigshafen am Rhein, bombed Schaffhausen, killing 40 Swiss citizens and destroying over fifty buildings. This was not an isolated incident. So how exactly did Switzerland, surrounded on all sides by Axis (or Central in WW1) and Allied powers during the wars to end all wars, manage to keep enemy troops at bay without much in the way of any fighting? Officially Switzerland maintains a policy of “Aggressive Neutrality” meaning that although it actively avoids taking part in conflicts, as evidenced by their air-force activities during WW2, it will defend its own interests with vigour. How vigorous? To ensure other countries respect its neutral stance, Switzerland has long put itself into a terrifyingly over prepared position to fight, and made sure every country around them was, and is, well aware of this fact. As for specifics, to begin with, a common misconception about Switzerland is that because it doesn’t actively take part in global military conflicts, that it doesn’t have a strong or well prepared military. In reality the Swiss military is a highly trained and competent fighting force, and due to the country’s policy of compulsory conscription of males (today women may volunteer for any position in the military, but are not required to serve) is surprisingly large for a country of only around eight million people. As for what fighting force is actively maintained, the Swiss military today is only around 140,000 men strong and just this year it has been voted to reduce that to 100,000. This is a major downsize from just two decades ago when it was estimated the Swiss military had some 750,000 soldiers. For reference, this latter total is about half the size of the United States military today, despite Switzerland having only about eight million people vs. the United States’ three hundred million. In addition to this, Switzerland has one of the highest rates of gun ownership in the world and many Swiss people are highly competent in handling said firearms due to both compulsory military service and a strong culture of recreational shooting (half a million Swiss children are said to be part of a gun club of some kind). This said, in recent years the rate of gun ownership has declined somewhat after a series of gun related incidents, such as one where a man shot his estranged wife with his old military issued rifle. Prior to the shooting, military conscripts would take their rifle home with them after their service ended and were expected to keep it ready for use in defending the country should the need arise. After these incidents, the military curbed this and implemented a new policy stating that any conscript wishing to keep their gun after service must buy it and apply for a permit. As part of this new policy, the Swiss military also no longer provides ammunition with the guns, instead keeping it in secure locations that citizens must get to in the event of an emergency. Speaking of emergencies, generally speaking, Switzerland is prepared for near any global catastrophe from nuclear fallout to a surprise invasion from an enemy force thanks to a defensive plan it has been implementing since 1880, but which was doubled-down upon during WW2 and later during the Cold War. Dubbed the Swiss National Redoubt, in a nutshell Switzerland has taken advantage of it unique natural geography, which includes mountains that surround it on nearly all sides, to build countless bunkers, fortifications and warehouses across the country that can be accessed at a moment’s notice. The full scale of the fortifications is a closely guarded secret, but some of them are kept in plain view as part of a comprehensive campaign of deterrence. Initially the National Redoubt consisted of tunnels bored into the many mountains of Switzerland in key strategic positions for retreating troops and citizens to take shelter in, but over the years these have evolved to encompass a host of ingenious defensive and offensive structures. Along with tunnels and bunkers (which are fully stocked and contain everything from bakeries and hospitals to dormitories), the mountains of Switzerland also hide countless tanks, aircraft, and hidden artillery guns (some of which are pointed directly at Switzerland’s own roads to destroy them in the event of invasion). Oddly for a landlocked country, Switzerland does maintain an active navy of sorts, though they don’t store any boats in its mountains as far as we could find. The naval branch of the Swiss forces’ primary role is in patrolling the country’s lakes on the border and providing aid in search and rescue operations. As for more specifically how they kept themselves out of the world wars, during WW1, the Swiss military, under freshly appointed General Ulrich Wille, mobilised well over 200,000 Swiss soldiers and deployed them across its major entry points to deter any outside forces from considering waging war on the country. After it became apparent that Switzerland’s neutrality would be recognised by all powers in the first Great War, the vast majority of the Swiss troops were sent home. (In fact, in the final year of the war, the Swiss military had shrunk its numbers to just 12,000.) Nothing further was required to keep the Swiss out of WW1. WW2 was a different beast altogether with Switzerland not banking on Hitler respecting their long-held neutral stance in European conflicts. Thus, newly appointed Swiss General Henri Guisan was given the unenviable task of trying to figure out a way to defend the small country from their neighbors, Hitler and his allies, despite that said powers drastically outmatched the Swiss army in a variety of ways. Towards this end, leading up to the war, the Swiss withdrew from the League of Nations to help ensure their neutrality, began to re-build their military (bringing the number up to 430,000 combat troops within three days of the start of the war), and strongly encouraged its citizens to keep at minimum two months’ worth of supplies on hand at any given time. On top of that, they also began secret negotiations with France to join forces against Germany, should Germany attack Switzerland (a risky move that was discovered by the Germans after France fell to them). But even with all that, knowing the Swiss couldn’t win if Hitler really wanted to invade, Guisan and co. made the decision to drastically ramp up their WW1 era strategy of making invading Switzerland as unsavory an option as possible. Guisan noted that by utilizing Switzerland’s harsh terrain, a comparatively small amount of Swiss soldiers in a secure defensive position could fight off a massive fighting force if the need ever arose. So the plan was essentially to perpetually defend and retreat to some fortified position over and over again, ultimately conceding the less defensible populated areas of the country once the government and citizens had managed a retreat into secret fortified positions in the Alps. They’d then use the Alps as a base from which to both launch guerrilla attacks to make life miserable for any successful invasion force and to use highly defensible positions there to keep crucial supply lines from the invaders. The multi-pronged plan worked and, while Hitler did have a detailed plan in place to invade Switzerland eventually, the cost of doing so was always too high given the Axis power’s troubles both on the Eastern and Western fronts. Thus, Switzerland was largely ignored by both Allies and the Axis throughout WW2, despite its amazingly well placed location right next to Germany, Italy, France, and Austria. Switzerland stepped up their level of defence during the Cold War, again mostly out of a desire to deter any potential invaders. This time, however, the focus was on “aggressively” defending Switzerland’s borders instead of defending them only long enough to cover a retreat into the well fortified mountains. Towards this end, Switzerland’s roads, bridges and train lines were rigged with explosives that could be detonated at any time. In many cases, the engineers who designed the bridges were required to come up with the most efficient way, using explosives, to ensure the complete destruction of those same bridges. Once the destruction plan was developed, hidden explosives were installed at the appropriate locations in the bridges. On top of that, the military also lined hundreds of mountains flanking major roads with explosives to create artificial rockslides. All total, over three thousand points of demolition are publicly known to have been implemented throughout the small country. With ground attacks covered, the Swiss looked to the skies. Unfortunately for them, attack by air is much harder to defend against for a country so small that enemy air forces could penetrate anywhere within its borders before an adequate defence could be mustered to defend its cities. To protect against this, the Swiss government constructed thousands of bomb shelters in homes, towns and cities to such a degree that it’s estimated that anywhere between 80 to 120 percent of the country’s population could hide in them for extended periods. Many of these shelters also included small hospitals and the necessary equipment to set up independent command centers. In fact, homes built after WW2 were often made with over 40 cm (16 in.) thick concrete ceilings to help them survive aerial bombings. If your home didn’t accommodate such a shelter, you had to pay a tax to support places that did. It’s also rumoured that much of Switzerland’s gold supply as well as vast supplies of food stores have been similarly squirreled away somewhere in the Alps, which comprise just over half of the country’s total land area. As a further example of how ridiculously well prepared the Swiss are for any and all threats, there are things like hidden hydroelectric dams built inside of unmarked mountains so that in the event of mass bombings, they’ll still have electricity from these secret facilities. And, remember, these are the things the Swiss government has let us know about. It is thought that there are probably more fortifications and hidden goodies scattered about the country’s landscape. Since the end of the Cold War (see How Did the Cold War Start and End), similar to how the Swiss government has been slowly disarming its population and reducing its standing army, decommissioning some of these fortifications has begun in order to reduce government spending. The Swiss government is somewhat coy about the extent of this disarming, but it has been reported that many of the more extreme defences, such as the explosives that used to be hidden inside the country’s bridges and along its road and railways, have been removed. As for the bunkers, unfortunately, simply abandoning many of these facilities is not an option, and it’s fairly expensive to decommission them. As such, as the head of security policy for the federal Department of Defense, Christian Catrina, said “…in most cases we’d be glad if someone would take them off our hands for no price”. In some cases, this has resulted in companies using the ridiculously well protected and secure mountain facilities as data repositories and server farms. In one such converted bunker, the servers inside are even completely protected from outside electromagnetic impulses that result from nuclear explosions. In another, detailed instructions on how to build devices for reading all known data storage formats, even older formats like floppy disks, are kept, so that if that knowledge is otherwise lost, future generations can still decode our data storage devices to access the data within correctly. Essentially, the researchers involved in this particular project have attempted to create a “Rosetta Stone” of data formats and are using a ridiculously secure Swiss bunker as the storage point for that knowledge. As a result of military downsizing, the fate of the rest of the fortifications is unclear and there are calls to decommission all of them, despite the estimated billion dollar price tag to do so. There is even a growing minority of the Swiss population who would like to see the entire military disbanded, including ceasing mandatory conscription. But for now, at least, any country that wishes to ignore Switzerland’s long-held neutrality in military conflicts will find the tiny country an exceptionally difficult one to conquer and occupy. And presumably if war ever again threatens Swiss’ borders, regardless of how small they make their military today, they’ll likely keep themselves in a position to rapidly ramp back up their defences as they did for WW1 and WW2. Shortly before WW2, Switzerland passed the Swiss Banking Act, which allowed bank accounts to be created anonymously, in no small part to allow German Jews to squirrel their liquid assets away into accounts that the Third Reich would have difficulty finding out about or getting access to. The term “Swiss Army Knife” was coined by United States soldiers after WWII. The soldiers had trouble pronouncing the original name of “Schweizer Offiziersmesser” (Swiss Officer’s Knife) and thus began calling the multi-tool a “Swiss Army Knife”. The company that makes Swiss Army Knives is Victorinox, named after the founder, Karl Elsener’s, deceased mother, Victoria. The “nox” part comes from the fact that stainless steel is also known as “inox”, which is short for the French term “inoxydable”. There has been a “fact” floating around that Switzerland has the highest number of guns per citizen and the lowest rate of people killed by firearms per year, but this isn’t correct. Switzerland is actually 4th in number of guns per 100 people (at 45.7 guns per 100), though does maintain a relatively low number of deaths per year due to firearms at just 3.84 per 100,000, which is good enough for 19th place overall. However, it should also be noted that 3.15 of those deaths per 100,000 are suicide. Their homicide rate (.52 per 100,000) is good enough for 31st place, with the rest of deaths from firearms (.17 per 100,000) being either accidental or undetermined. While the United States has by far the most guns per capita at 94.3 guns per 100 residents, it is only 12th in firearm related deaths per capita at 10.3 per 100,000 people. 6.3 of those 10.3 firearm related deaths are suicides. This equates to the U.S. being in 14th place on the number of firearm related homicides per 100,000 and overall 103rd as far as total murders per 100,000 at 4.8. For reference, that’s four times the murders per 100,000 than the United Kingdom, which sits in 169th place in murders per 100,000. Number 1 by far in firearm related deaths per 100,000 is Honduras with 64.8 deaths per 100,000 from firearms. Surprisingly, Honduras only has 6.2 guns for every 100 people in the country. Honduras also has the highest rate of murders per 100,000 overall at 91.6. On average, more people commit crimes in Switzerland who aren’t Swiss citizens than who are every year, which has very recently led to harsher deportation laws. In fact, of the top 25 nationalities to commit crimes in Switzerland, 21 of them commit more crimes than the Swiss while on Swiss soil, with the average of all those immigrants being 390% more crimes than are committed by Swiss citizens. Immigrants specifically from Austria, France, and Germany to Switzerland, however, commit an average of only 70% of the crimes the Swiss do on Swiss soil. That is impressive! Great post! Didn’t a lot the Nazis keep money Swiss Banks? Very good article!